Can I Hang Up A Thangka Received as a Gift? I received a very nice thangka of White Mahakala from a very good friend. He even had it specially framed, and I believe just the framing itself cost a good deal of money (possibly around $300). My friend doesn't know much about Tibetan Buddhism, and took the thangka solely to be a piece of art. I know I'm not supposed to hang up thangkas in my apartment like it's just a piece of art, but I also would not like to offend my friend. Thoughts? Re: Can I Hang Up A Thangka Received as a Gift? Treat it with respect, maybe arrange a small table underneath it with some flowers, or something....doesn't have to be too elaborate, you know. Mr. G wrote: I received a very nice thangka of White Mahakala from a very good friend. He even had it specially framed, and I believe just the framing itself cost a good deal of money (possibly around $300). My friend doesn't know much about Tibetan Buddhism, and took the thangka solely to be a piece of art. I know I'm not supposed to hang up thangkas in my apartment like it's just a piece of art, but I also would not like to offend my friend. Thoughts? White Mahakala, that is very auspicious! Have it consecrated by a qualified lama and put it up. 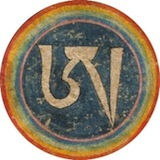 White Mahakala was the first empowerment I ever received, and it was from Luding Khen Rinpoche. Hang it with the 8 offerings. And put a khatags over it.